The very first edition of the Audio Days. 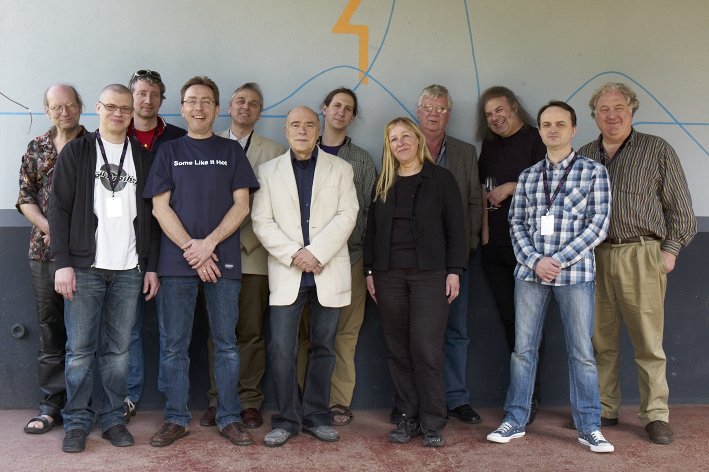 From left to right : Dave Hill, Christophe Bouillot, Andy Eschenwecker, Jesper Bo Nielsen, Greg Gualtieri, Jean-Jacques Bacquet, Andrew Roberts, Almuth Buchleitner, Geoff Daking, Dave Amels, Olivier Bolling, David Josephson. 11h00 : microphone specifications, what they teach and what they keep secret by David Josephson (Josephson Engineering). To listen to this conference, click here. 12h30 : l’Ambisonique ou le double processus créatif by Jean-Marc l’Hotel, Klaus Blasquiz and Alain Parmentier. To listen to this conference, click here : first part / second part. 14h30 : quality equals simplicity or how the use of high quality analog equipment can make the engineer, producer and musicians experience a far more simple and pleasant process for both recording and mixing by Jesper Bo Nielson (Tube-Tech). To listen to this conference, click here : first part / second part. 16h30 : Q&A session with Greg Gualtieri (AnaMod / Pendulum), Dave Amels (AnaMod), Jonathan Little (Little Labs) and Geoff Daking (Daking). To listen to this conference, click here. 11h00 : flexibility in microphone patterns for stereo and surround by David Josephson (Josephson Engineering). To listen to this conference, click here. 12h30 : quality equals simplicity or how the use of high quality analog equipment can make the engineer, producer and musicians experience a far more simple and pleasant process for both recording and mixing by Jesper Bo Nielson (Tube-Tech). To listen to this conference, click here : first part / second part. 16h00 : Q&A session with Dave Hill (Crane Song / Dave Hill Designs). To listen to this conference, click here.